Today I have the Models Own Beetlejuice Collection to show you. I'm a little late to the party with this one - it originally came out last year, but it was sold out for a while so I've only recently got my hands on it (in fact, I bought it as a present to myself when I started a new job last month). 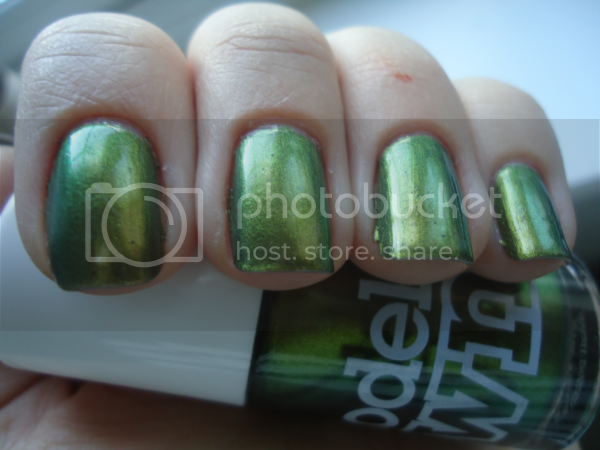 In case you don't know, Beetlejuice is a collection of five duochrome polishes. I wore each of these as a full manicure for a few days so I could see how well they last. Aqua Violet. 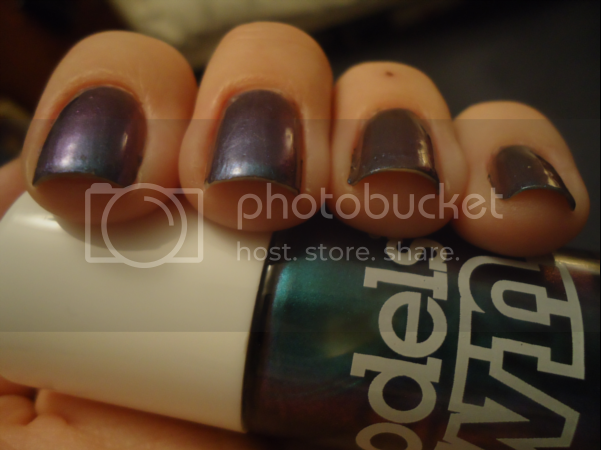 A blue/purple duochrome. The colour shift was stronger in real life than it appears in my photos. I didn't like the formula at all, it was quite runny and pooled on my cuticles, but it only needed two thickish coats for full opacity. I adore the colour - I'm a sucker for blues and purples! Wear time was rubbish. I took these photos the day after I put it on, and it's chipped already! Emerald Black. This was the least duochrome of all of them. Despite the name, I wouldn't say there is actually any emerald apparent in it. It's more a blackened base with teal shimmer. However, I rather like it regardless as I think it's a great twist on the standard black polish. 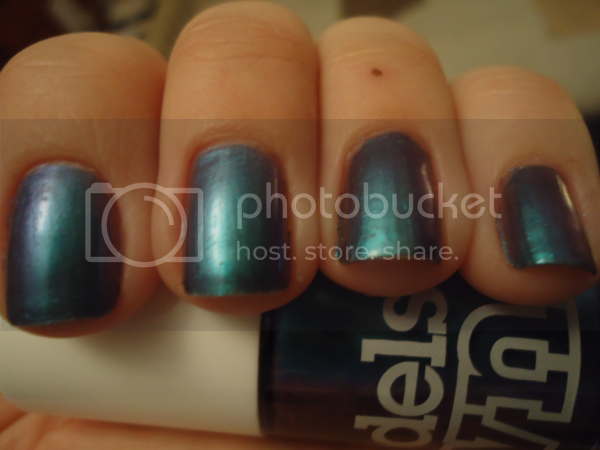 I had no trouble with the formula of this one, and it was opaque in two coats. Golden Green. I'm going to admit something a little controversial here: I am not a fan of green nail polish. Or green in general, actually. I have brown hair and blue eyes; green is not a shade that suits me. 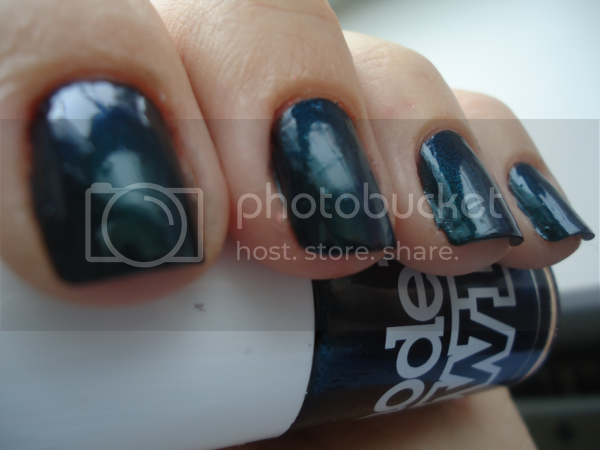 I hated this polish when I first put it on, and I was tempted to remove it immediately. I'm glad I resisted, though, as it definitely grew on me. 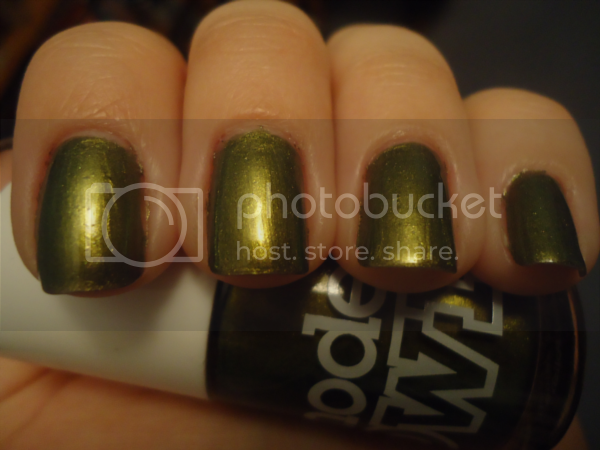 It's a green/yellow duochrome that some have likened to Chanel Peridot. It's actually really pretty. Formula wise, unfortunately it was identical to Aqua Violet and was rather runny...and lasted equally badly. It also showed the brushstrokes when it dried. Sad face. Pinky Brown. 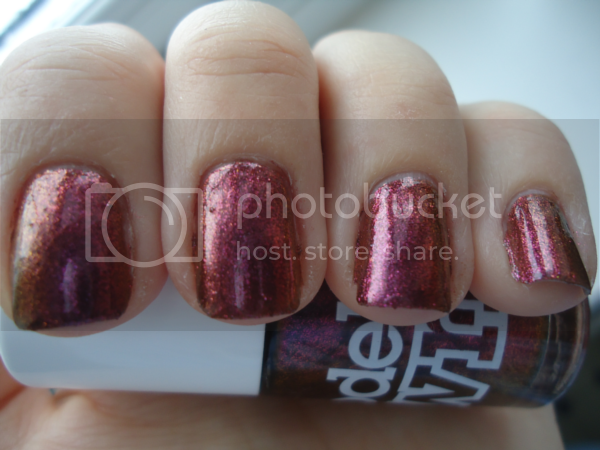 This a pink/copper duochrome with itty bitty glitter in it. It was thicker than Aqua Violet and Golden Green, so I liked the formula much more as a result. It only needed two coats, and it lasted about three days before it chipped. I really like this one. Doesn't it look like autumn in a bottle? Purple Blue. 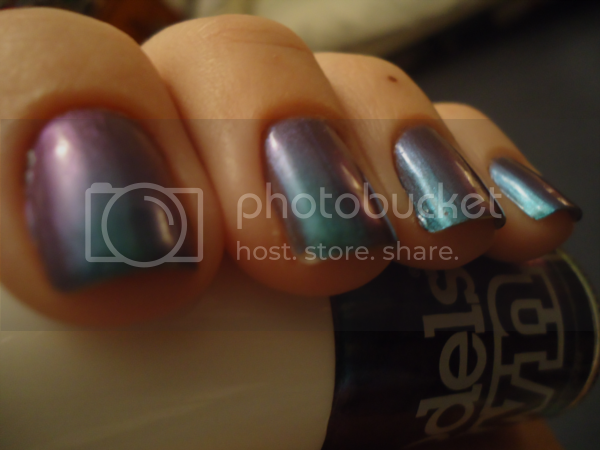 A pink/blue/purple multichrome. 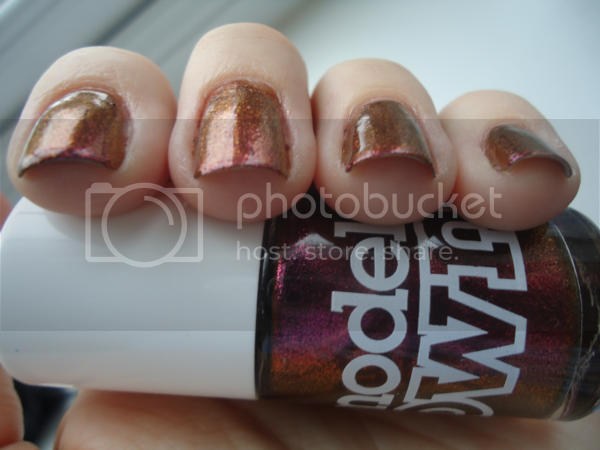 It has the same glitter and formula as Pinky Brown, which was good. This is hands down my favourite of the collection. The colour shift on this one is incredible, particularly in sunlight. I wore this polish at the Museum of London recently, and I spent almost as much time looking at my nails as I did the exhibits! Overall, I'm really impressed with the Models Own Beetlejuice Collection. Despite the rubbish formula on a couple of these polishes, the colours are beautiful, interesting and - dare I say? - quite unique. I will definitely wear them all again (even Golden Green!). I bought these polishes on the Models Own website. They retail for £5 each, or £20 for the set of five plus a 3-in-1 top coat. Very good value, oui?